We welcome you to a very unique area of South Carolina. The Greater Cayce-West Columbia area is home to an interesting array of nature and commerce blending throughout our region. This is one of the few locations in the United States where you can kayak class IV rapids and exit the water in a bustling downtown environment. Our rivers host great recreational opportunities such as fishing, tubing, canoeing, and rafting. The Congaree and Saluda provide the incredible backdrop to some of the best urban hiking and strolling on over 9 miles of amazing Riverwalk. We encourage you to explore our many natural sites while taking in almost 12,000 years of continuous history. We invite you to enjoy many cultural events like live music in our parks as well as theaters and museums just across the Congaree River in downtown Columbia. Take in the great flavors of our many local restaurants and dwell in the time honored tradition of antiquing. Join us for a long weekend with a multitude of activities just moments apart. Here you can keep busy visiting an award winning zoo or relax and let our rivers flow the day away in our home of Southern hospitality. Spring in our area means the Trout are schooling and the Striped Bass are running, which create some of the best seasonal fishing attractions in South Carolina. April 27th The Greatest Festival Day!! Kinetic Derby Days and “Soiree on State” which run consecutively on April 27th as the major part of the West of Weekend Celebration! These two events compliment each other and flow seamlessly together. Plan your day of Art, Sport, games, and outstanding Music! On Saturday, April 27, 2019, the streets of West Columbia will be filled with art, kinetic floats, soapbox racing, and thousands of people gathering together for the second annual Kinetic Derby Day. The event spurs creative thinking, competition, and family fun as teams come together to build unusual vehicles and awe-inspiring art installations. move along the parade route. The themes range from flying monsters to bizarre satire. in adult and children divisions. Awards are given for the best art car, the fastest car, and best wipeout. At the bottom of the hill, take a right on to State Street to find art installations, artist tents, interactive science fun, food trucks, and exhibition soapbox racing. community pride, and showcase our growing community ready for economic investment. skills to construct the ideas they imagine. Please join the City of Cayce on April 27, 2019 for the third annual Soiree on State! 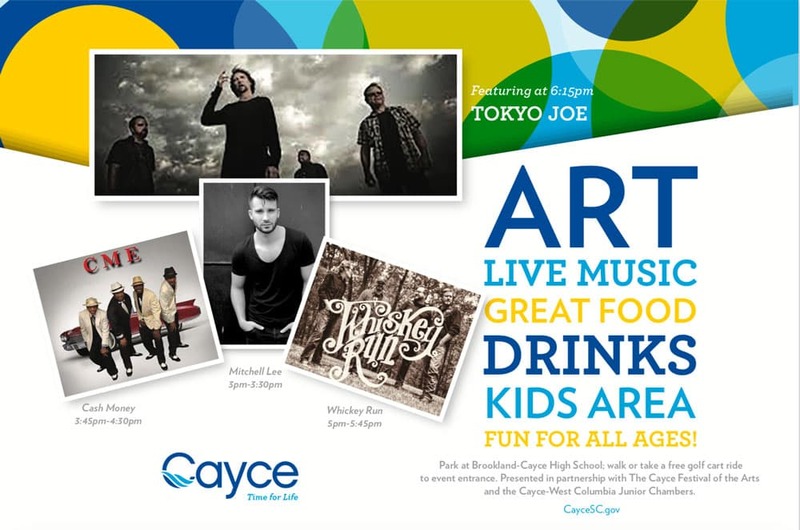 Our City is again partnering with the Cayce Avenues Neighborhood Association to combine the Cayce Festival of the Arts with the Soiree on State. This collaboration expands the Soiree on State to include more artists, musicians, a kid’s area, and fun from the afternoon to the evening! The Soiree on State will run along State Street, from Poplar Street to Railroad Street from 3:00 pm to 8:00 pm. The years following the Civil War were a time of great upheaval. After the bloodiest war in American history, the country was redefining itself. A caisson used by soldiers returning from Appomattox, Va.
Farm tools used by workers in the aftermath of the Civil War. Desk and chair from the State House, used during Reconstruction. A copy of the state’s 1868 constitution. Items owned by Reconstruction era politicians and Gov. Wade Hampton, III. The exhibit also explores the struggles faced by African-Americans to define their newly acquired citizenship on their terms against forces that would return the state to its prewar structure. This tumultuous era for South Carolinians had broad triumphs and laid the groundwork for future victories in civil and equal rights. Visitors will learn that although Reconstruction ended in 1876, we continue to struggle with its promises today. From moonshine and craft beer to sweet tea, discover the history, craftsmanship and unique stories behind South Carolina’s most iconic drinks.